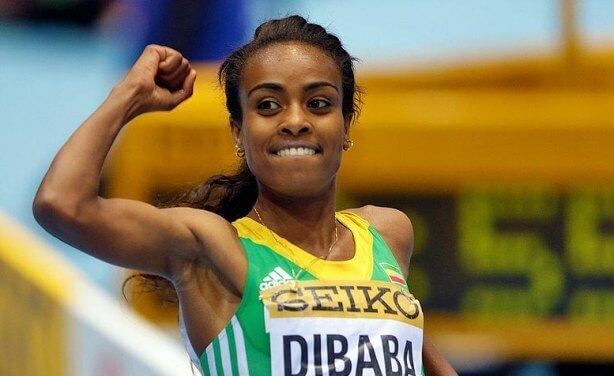 Ethiopia won the first gold medal at the IAAF Beijing World Athletics Championship in the female 1,500 mt race with world record holder Athlete Genzebe Dibaba in Beijing, yesterday. Genzebe Dibaba won the race leaving the second place for Kenyan Faith Kipyegon and the Netherlands athlete of Ethiopian origin Sifan Hassan third. Genzebe ran a last 800 m of 1:57.2 in the 1,500 m for the Ethiopian’s first global title. Genzebe Dibaba is also a two-time world indoor champion. Genzebe, whose elder sister Tirunesh is a multiple world champion, won in 4:08.09, and the 24-year-old looks good to add more medals of her own after dictating the final like a veteran. The sister of the triple Olympic champion Tirunesh and the cousin of the twice Olympic champion Derartu Tulu, Genzebe added the outdoor title to the indoor world crown she won in 2012. Tirunesh, who took this season off to have a baby, won the 5,000 m-10,000 m double at the Bird’s Nest Stadium in 2008. Kenya’s former world junior champion Faith Kipyegon was the only runner to stay with Genzebe over the last 400 and took silver in 4.08.96. The Ethiopian-born Sifan Hassan took bronze for the Netherlands in 4.09.34 but was not happy. Laura Muir’s bid for the first major medal of her career ended in disappointment when she came home fifth. The Scot left herself too much to do and was never in contention, despite finishing strongly, crossing the line in 4:11.48.